More than a century ago, Nobel Prize laureate Paul Ehrlich formulated the idea of a “magic bullet”. This is a virtual drug that hits its target while bypassing healthy tissues. No field of medicine could benefit more from the development of a “magic bullet” than cancer chemotherapy, which is complicated by severe side effects. For decades, the prospects of developing “magic bullets” remained elusive. During the last decade, progress in nanomedicine has enabled tumor-targeted delivery of anticancer drugs via their encapsulation in tiny carriers called nanoparticles. Nanoparticle tumor targeting is based on the “Achilles’ heels” of cancerous tumors – their poorly organized and leaky microvasculature. Due to their size, nanoparticles are not capable to penetrate through a tight healthy tissue vasculature. In contrast, nanoparticles penetrate through a leaky tumor microvasculature thus providing for localized accumulation in tumor tissue. After tumor accumulation of drug-loaded nanoparticles, a drug should be released from the carrier to allow penetration into a site of action (usually located in a cell cytoplasm or nucleus). A local release of an encapsulated drug may be triggered by tumor-directed ultrasound; application of ultrasound has additional benefits: ultrasound enhances nanoparticle penetration through blood vessel walls (extravasation) as well as drug uptake (internalization) by tumor cells. For decades, ultrasound has been used only as an imaging modality; the development of microbubbles as ultrasound contrast agents in early 2000s has revolutionized imaging. Recently, microbubbles have attracted attention as drug carriers and enhancers of drug and gene delivery. 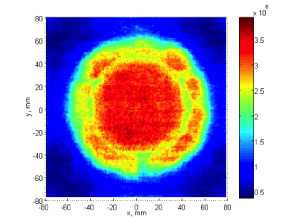 Microbubbles could have been ideal carriers for the ultrasound-mediated delivery of anticancer drugs. Unfortunately, their micron-scale size does not allow effective extravasation from the tumor microvasculature into tumor tissue. In Dr. Rapoport’s lab, this problem has been solved by the development of nanoscale microbubble precursors, namely drug-loaded nanodroplets that converted into microbubbles under the action of ultrasound[1-6]. 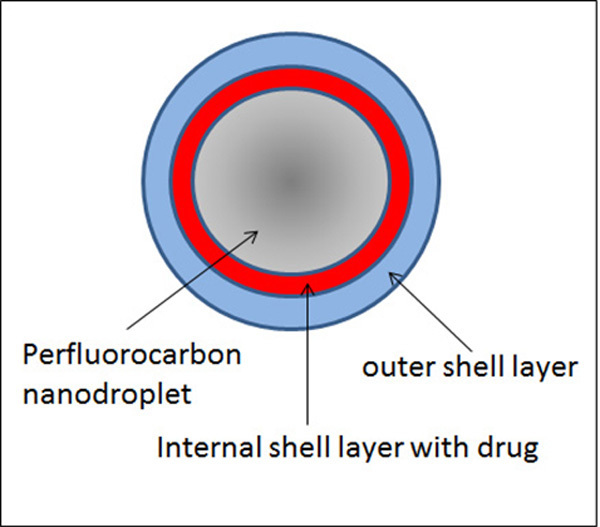 Nanodroplets comprised a liquid core formed by a perfluorocarbon compound and a two-layered drug-containing polymeric shell (Figure 1.Schematic representation of a drug-loaded nanodroplet). An aqueous dispersion of nanodroplets is called nanoemulsion. A suggested mechanism of therapeutic action of drug-loaded perfluorocarbon nanoemulsions is discussed below [3, 5, 6]. A nanoscale size of droplets (ca. 250 nm) provides for their extravasation into a tumor tissue while bypassing normal tissues, which is a basis of tumor targeting. Upon nanodroplet tumor accumulation, tumor-directed ultrasound triggers nanodroplet conversion into microbubbles, which in turn triggers release of a nanodroplet-encapsulated drug. This is because in the process of the droplet-to-bubble conversion, particle volume increases about a hundred-fold, with a related decrease of a shell thickness. 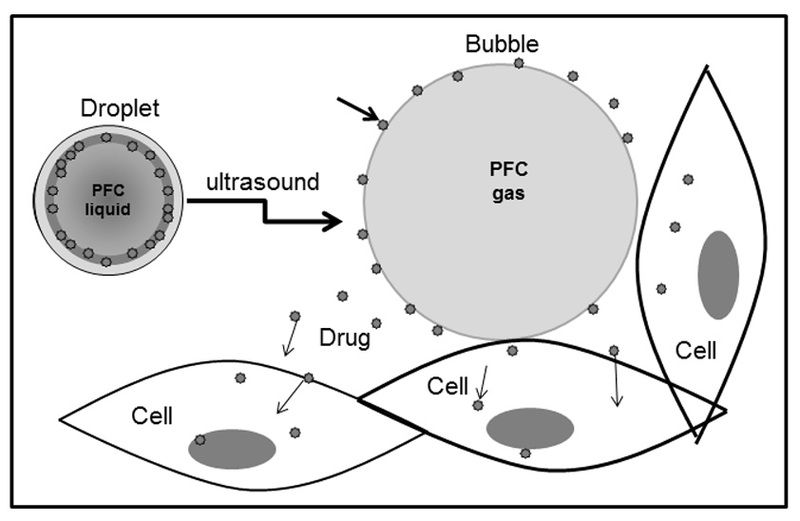 Microbubbles oscillate in the ultrasound field, resulting in a drug “ripping” off a thin microbubble shell (Figure 2. Schematic representation of the mechanism of drug release from perfluorocarbon nanodroplets triggered by ultrasound-induced droplet-to-bubble conversion; PFC – perfluorocarbon). In addition, oscillating microbubbles enhance internalization of released drug by tumor cells. (Figure 3. A – Photographs of a mouse bearing a subcutaneously grown breast cancer tumor xenograft treated by four systemic injections of the nanodroplet-encapsulated anticancer drug paclitaxel (PTX) at a dose of 40 mg/kg as PTX. B – Photographs of a mouse bearing two ovarian carcinoma tumors (a) – immediately before and (b) – three weeks after the end of treatment; mouse was treated by four systemic injections of the nanodroplet-encapsulated PTX at a dose of 20 mg/kg as PTX; only the right tumor was sonicated. C – Photographs (a, c) and fluorescence images (b, d) of a mouse bearing fluorescent pancreatic tumor taken before (a, b) and three weeks after the one-time treatment with PTX-loaded nanodroplets at a dose of 40 mg/kg as PTX (c,d). The tumor was completely resolved and never recurred) [3, 4, 6]. In the current presentation, the proposed mechanism of a therapeutic action of drug-loaded, ultrasound-activated perfluorocarbon nanoemulsions has been tested using intravital laser fluorescence microscopy performed in collaboration with Dr. Brian O’Neill (then with Houston Methodist Research Institute, Houston, Texas) . Fluorescently labeled nanocarrier particles (or a fluorescently labeled drug) were systemically injected though the tail vein to anesthetized live mice bearing subcutaneously grown pancreatic tumors. Nanocarrier and drug arrival and extravasation in the region of interest (i.e. normal or tumor tissue) were quantitatively monitored. Various drug nanocarriers in the following size hierarchy were tested: individual polymeric molecules; tiny micelles formed by a self-assembly of these molecules; nanodroplets formed from micelles. The results obtained confirmed the mechanism discussed above. As expected, dramatic differences in the extravasation rates of nanoparticles were observed. The extravsation of individual polymer molecules was extremely fast even in the normal (thigh muscle) tissue; In contrast, the extravasation of nanodroplets into the normal tissue was very slow. (Figure 4. A – Bright field image of the adipose and thigh muscle tissue. B,C – extravasation of individual molecules (B – 0 min; C – 10 min after injection); vasculature lost fluorescence while tissue fluorescence increased. D,E – extravasation of nanodroplets; blood vessel fluorescence was retained for an hour of observation (D – 30 min; E – 60 min after injection). Nanodroplet extravasation into the tumor tissue was substantially faster than that into the normal tissue thus providing for effective nanodroplet tumor targeting. Tumor-directed ultrasound significantly enhanced extravasation and tumor accumulation of both, micelles and nanodroplets (Figure 5. Effect of ultrasound on the extravasation of Fluorescence of blood vessels dropped while that of the tumor tissue increased after ultrasound). Also, pay attention to a very irregular tumor microvasculature, to be compared with that of a normal tissue shown in Figure 4. The ultrasound effect on nanodroplets was 3-fold stronger than that on micelles thus making nanodroplets a better drug carriers for ultrasound-mediated drug delivery. On a negative side, some premature drug release into the circulation that preceded tumor accumulation was observed. This proposes directions for a further improvement of nanoemulsion formulations. Breast cancer remains the first cause of death among American women under the age of 60. Although modern imaging technologies, such as enhanced mammography (tomosynthesis), MRI and ultrasound, can visualize a suspicious mass in breast, it often remains unclear whether the detected mass is cancerous or non-cancerous until a biopsy is performed. Despite high sensitivity for detecting lesions, no imaging modality alone has yet been able to determine the type of all abnormalities with high confidence. For this reason most patients with suspicious masses, even those with very small likelihood of a cancer, opt in to undergo a costly and painful biopsy. It is long believed that cancerous tumors grow in the form of stiff masses that, if found to be superficial enough, can be identified by palpation. The feeling of hardness under palpation is directly related to the tissue’s tendency to deform upon compression. Elastography, which has emerged as a branch of ultrasound, aims at capturing tissue stiffness by relating the amount of tissue deformation under a compression to its stiffness. While this technique has shown promising results in identifying some types of breast lesions, the diversity of breast cancer types leaves doubt whether stiffness alone is the best discriminator for diagnostic purposes. Studies have shown that tissues subjected to a sudden external force do not deform instantly, rather they deform gradually over a period of time. Tissue deformation rate reveals another important aspect of its mechanical property known as viscoelasticity. This is the main material feature that, for example, makes a piece of memory foam to feel differently from a block of rubber under the touch. Similar material feature can be used to explore mechanical properties of different types of tissue. In breast masses, studies have shown that biological pathways leading to different breast masses are quite different. While in benign lesions an increase in a protein-based component can potentially increase its viscosity, hence a slower deformation rate compared to normal tissue, the opposite trend occurs in malignant tumors. In this study, we report on using an ultrasound technique that enables capturing the deformation rate in breast tissue. 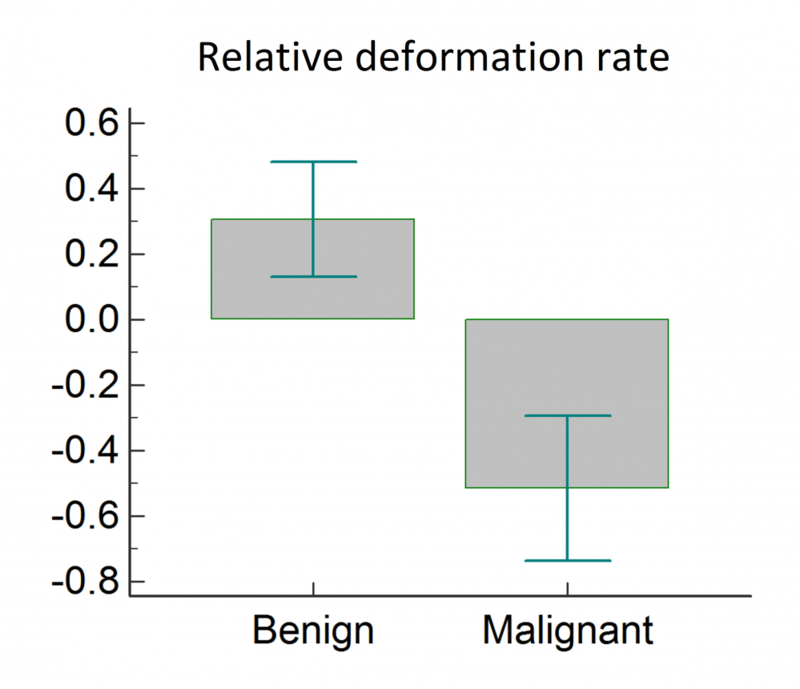 We studied 43 breast masses in 42 patients and observed that a factor based on the deformation rate was significantly different in benign and malignant lesions (Fig. 1). Figure1- Distribution of relative deformation rates for malignant and benign breast lesions. A significantly different relative deformation rates can be observed in the two groups, thus allowing differentiation of such lesions. The assessment of the human skeletal health condition is of great importance ranging from newborn infants to the elderly. Annually, approximately fifty percent of the 550,000 premature newborn infants in the United States suffer from bone metabolism related disorders such as osteopenia, which affect the bone development process into childhood. 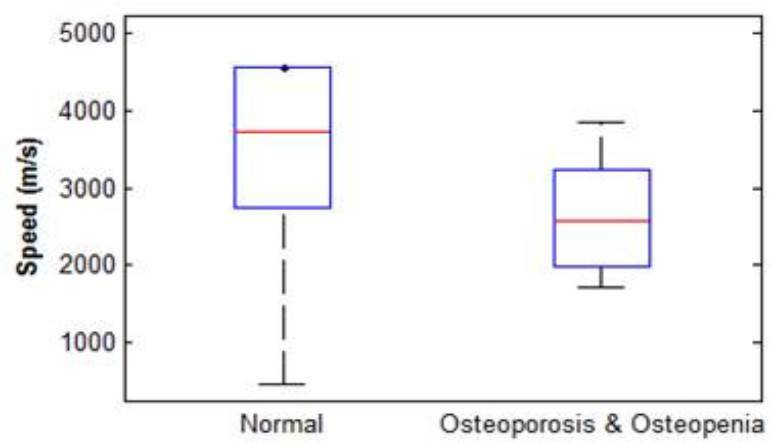 As we age through adulthood, reductions in our bone mass increases due an unbalance activity in the bone reformation process leading to bone diseases such as osteoporosis; putting a person at risk for fractures in the neck, hip and forearm areas. Currently bone assessment tools include dual-energy X-ray absorptiometry (DEXA), and quantitative ultrasound (QUS). DEXA is the leading clinical bone quality assessment tool, detecting small changes in bone mineral content and density. However, DEXA uses ionizing radiation for imaging thus exposing patients to very low radiation doses. This can be problematic for frequent clinical visits to monitor the efficacy of prescribed medications and therapies. QUS has been sought as a nonionizing and noninvasive alternative to DEXA. QUS utilizes measurements of ultrasonic waves between a transmitting and a receiving transducer aligned in parallel along bone surface. Speed of sound (SOS) measurements of the received ultrasonic signal is used to characterize the bone material properties. The determination of the SOS parameter is susceptible to the amount of soft tissue between the skin surface and the bone. Thus, we propose utilizing a high intensity ultrasonic wave known as a “push beam” to exert a force on the bone surface thereby generating vibrations. This will minimize the effects of the soft tissue. The radiate sound wave due to these vibrations are captured and used to analyze the bone mechanical properties. This work demonstrates the feasibility of evaluating bone mechanical properties from sound waves due to bone vibrations. Under an approved protocol by the Mayo Clinic Institutional Review Board (IRB), human volunteers were recruited to undergo our noninvasive bone assessment technique. Our cohort consisted of clinically confirmed osteopenia and osteoporosis patients, as well as normal volunteers without a history of bone fractures. An ultrasound probe and hydrophone were placed along the volunteers’ tibia bone (Figure 1a). A B-mode ultrasound was used to guide the placement of our push beam focal point onto the bone surface underneath the skin layer (Figure 1b). The SOS was obtained from the measurements. Figure 1. (a) Probe and hydrophone alignment along the tibia bone. (b) Diagram of an image-guided push beam focal point excitation on the bone surface. In total 14 volunteers were recruited in our ongoing study. 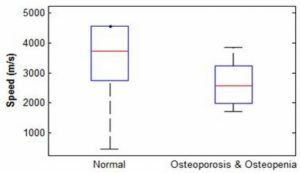 A boxplot comparison of SOS between normal and bone diseased (osteopenia and osteoporotic) volunteers in Figure 2, shows that typically sound travels faster in healthy bones than osteoporotic and osteopenia bones with SOS median values (red line) of 3733 m/s and 2566 m/s, respectively. Hence, our technique may be useful as a noninvasive method for monitoring the skeletal health status of the premature and aging population. Figure 2. Normal and bone diseased volunteers sound of speed comparisons. This ongoing project is being done under an approved protocol by Mayo Institutional Review Board. 3aBA5 – Fabricating Blood Vessels with Ultrasound – Diane Dalecki, Ph.D., Eric S. Comeau, M.S., Denise C. Hocking, Ph.D.
Tissue engineering is the field of science dedicated to fabricating artificial tissues and organs that can be made available for patients in need of organ transplantation or tissue reconstructive surgery. Tissue engineers have successfully fabricated relatively thin tissues, such as skin substitutes, that can receive nutrients and oxygen by simple diffusion. However, recreating larger and/or more complex tissues and organs will require developing methods to fabricate functional microvascular networks to bring nutrients to all areas of the tissue for survival. In the laboratories of Diane Dalecki, Ph.D. and Denise C. Hocking, Ph.D., research is underway to develop new ultrasound technologies to control and enhance the fabrication of artificial tissues1. Ultrasound fields are sound fields at frequencies higher than humans can hear (i.e., > 20 kHz). Dalecki and Hocking have developed a technology that uses a particular type of ultrasound field, called an ultrasound standing wave field, as a tool to non-invasively engineer complex spatial patterns of cells2 and fabricate microvessel networks3,4 within artificial tissue constructs. When a solution of collagen and cells is exposed to an ultrasound standing wave field, the forces associated with the field lead to the alignment of the cells into planar bands (Figure 1). The distance between the bands of cells is controlled by the ultrasound frequency, and the density of cells within each band is controlled by the intensity of the sound field. The collagen polymerizes into a solid gel during the ultrasound exposure, thereby maintaining the spatial organization of the cells after the ultrasound is turned off. More complex patterning can be achieved by use of more than one ultrasound transducer. An exciting application of this technology involves the fabrication of microvascular networks within artificial tissue constructs. Specifically, acoustic-patterning of endothelial cells into planar bands within collagen hydrogels leads to the rapid development of microvessel networks throughout the entire volume of the hydrogel. Interestingly, the structure of the resultant microvessel network can be controlled by choice of the ultrasound exposure parameters. As shown in Figure 2, ultrasound standing wave fields can be employed to fabricate microvessel networks with different physiologically relevant morphologies, including capillary-like networks (left panel), aligned non-branching vessels (center panel) or aligned vessels with hierarchically branching microvessels. Ultrasound fields provide an ideal technology for microvascular engineering; the technology is rapid, noninvasive, can be broadly applied to many types of cells and hydrogels, and can be adapted to commercial fabrication processes. To learn more about this research, please view this informative video (https://www.youtube.com/watch?v=ZL-cx21SGn4). Figure 2. Ultrasound-fabricated microvessel networks within collagen hydrogels. The ultrasound pressure amplitude used for initial patterning determines the final microvessel morphology, which can resemble torturous capillary-like networks (left panel), aligned non-branching vessels (center panel) or aligned vessels with hierarchically branching microvessels. Scale bars = 100 μm. Dalecki D, Hocking DC. Ultrasound technologies for biomaterials fabrication and imaging. Annals of Biomedical Engineering 43:747-761; 2015. Garvin KA, Hocking DC, Dalecki D. Controlling the spatial organization of cells and extracellular matrix proteins in engineered tissues using ultrasound standing wave fields. Ultrasound Med. Biol. 36:1919-1932; 2010. Garvin KA, Dalecki D, Hocking DC. Vascularization of three-dimensional collagen hydrogels using ultrasound standing wave fields. Ultrasound Med. Biol. 37:1853-1864; 2011. Garvin KA, Dalecki D, Youssefhussien M, Helguera M, Hocking DC. 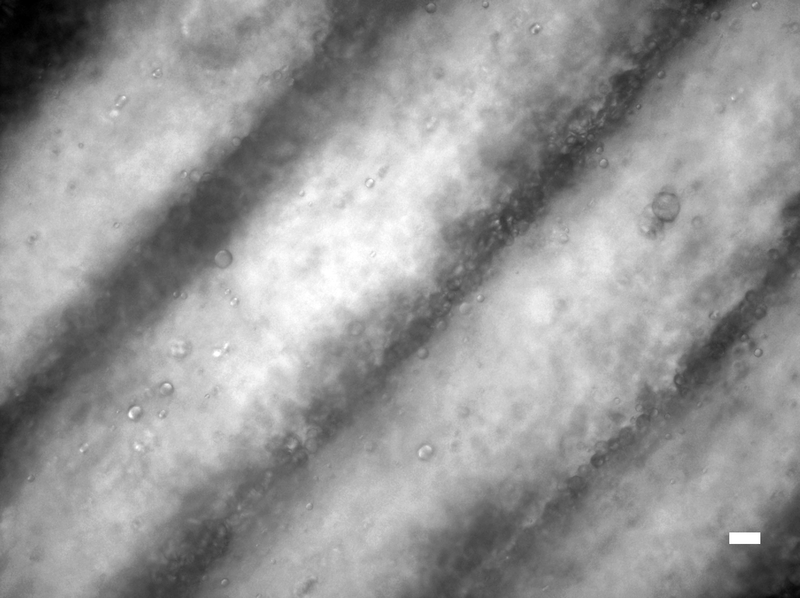 Spatial patterning of endothelial cells and vascular network formation using ultrasound standing wave fields. J. Acoust. Soc. Am. 134:1483-1490; 2013. In focused ultrasound surgery (FUS), an ultrasound source radiates pressure waves into the patient’s body to achieve a desired therapeutic effect. FUS has already gained regulatory approval in the U.S. for treating uterine fibroids and pain palliation for bone metastases; other applications – including prostate cancer, liver cancer, and neurosurgery – remain active topics for clinical trials and research. Because applications of FUS often involve high intensity levels, insufficient knowledge of the acoustic field in the patient could lead to damage of healthy tissue away from the targeted treatment site. In this sense, high-intensity ultrasound treatments could cause collateral effects much like radiotherapy treatments that use ionizing radiation. In radiotherapy, treatment planning is critical for delivery of an effective and safe treatment: Typically, CT or MRI is used to form a virtual patient and the treatment is planned by computer-aided design. Simulations are used to plan the geometric, radiological, and dosimetric aspects of the therapy using radiation transport simulations. Analogous to a radiation beam, ultrasound therapy uses an acoustic beam as a 3D “scalpel” to treat tumors or other tissues. Accordingly, there is motivation to establish standard procedures for FUS treatment planning that parallel those in radiotherapy [1, 2]. However, such efforts toward treatment planning first require very precise knowledge of the source transducer in order to accurately predict the acoustic beam structure inside the patient. Fig. 1 Acoustic holography to characterize an ultrasound source, with schematic illustration of the corresponding ultrasound field. A measured hologram in a plane can be used to reconstruct the entire wave field anywhere in 3D space. Toward this end, it is instructive to recognize that ultrasound comprises pressure waves and thus possesses several basic features of wave physics that can be used in practice. 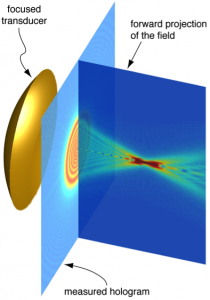 One such feature is the potential to reproduce a 3D wave field from a 2D distribution of the wave amplitude and phase. This principle was made famous in optics by Dennis Gabor (Nobel Prize, 1971), who invented holography . A similar approach is possible in acoustics [4 – 8] and is illustrated in Fig. 1 for a therapeutic ultrasound source. To measure an acoustic hologram, a hydrophone (i.e., a microphone used underwater) can be scanned across a plane in front of the transducer. Because these measurements in 2D capture the whole field, this measured hologram can be used to reconstruct the surface vibrations of the source transducer. In turn, once the vibrations of the source are known, the corresponding acoustic field can be computed in water or tissue or any other medium with known properties. Besides ultrasound surgery, holography techniques can be applied to characterize ultrasound transducers used for other therapeutic and diagnostic ultrasound-based applications. In this work we have used it for the first time to characterize a shock wave lithotripter source. Shock wave lithotripters radiate high intensity pulses that are focused on a kidney stone. High pressure, short rise time, and path-dependent nonlinearity make characterization in water and extrapolation to tissue difficult. 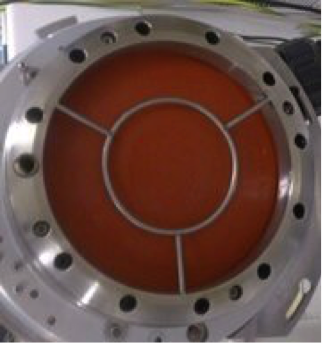 The electromagnetic lithotripter characterized in this effort is a commercial model (Dornier Compact S, Dornier MedTech GmbH, Wessling, Germany) with a 6.5 mm focal width. A broadband hydrophone (a fiber optic probe hydrophone, model FOPH 2000, RP Acoustics; Leutenbach, Germany) was used to sequentially measure the field over a set of points in a plane in front of the source. Following the previously developed transient holography approach, the recorded pressure field was numerically back-propagated to the source surface (Fig. 2). The method provides an accurate boundary condition from which the field in tissue can be simulated. Fig. 2 Characterization of an electro-magnetic shock wave lithotripter. Top: A photo of the lithotripter head. Bottom: Holographically reconstructed peak-to-peak pressure along the transducer face. In addition, we use acoustic holography to characterize imaging probes, which generate short, transient pulses of ultrasound (Fig. 3). Accurate 3D field representations have been confirmed . Fig. 3 Characterization of a diagnostic imaging probe. Top: A photo of the HDI C5-2 probe, which was excited at a frequency of 2.3 MHz. Middle: Holographically reconstructed pattern of vibration velocities along the probe surface. Bottom: Corresponding phase distribution. We believe that our research efforts on acoustic holography will make it possible in the near future for manufacturers to sell each medical ultrasound transducer with a “source hologram” as a part of its calibration. This practice will enable calculation of the 3D ultrasound and temperature fields produced by each source in situ, from which the “dose” delivered to a patient can be inferred with better accuracy than is currently achievable. 1. White PJ, Andre B, McDannold N, Clement GT. A pre-treatment planning strategy for high-intensity focused ultrasound (HIFU) treatments. Proceedings 2008 IEEE International Ultrasonics Symposium, 2056-2058 (2008). 2. Pulkkinen A, Hynynen K. Computational aspects in high intensity ultrasonic surgery planning. Comput. Med. Imaging Graph. 34(1), 69-78 (2010). 3. Gabor D. A new microscopic principle. Nature 161, 777-778 (1948). 4. Maynard JD, Williams EG, and Lee Y. Nearfield acoustic holography: I. Theory of generalized holography and the development of NAH. J. Acoust. Soc. Am. 78, 1395-1413 (1985). 5. Schafer ME, Lewin PA. Transducer characterization using the angular spectrum method. J. Acoust. Soc. Am. 85(5), 2202-2214 (1989). 6. Sapozhnikov O, Pishchalnikov Y, Morozov A. Reconstruction of the normal velocity distribution on the surface of an ultrasonic transducer from the acoustic pressure measured on a reference surface. Acoustical Physics 49(3), 354–360 (2003). 7. Sapozhnikov OA, Ponomarev AE, Smagin MA. Transient acoustic holography for reconstructing the particle velocity of the surface of an acoustic transducer. Acoustical Physics 52(3), 324–330 (2006). 8. Kreider W, Yuldashev PV, Sapozhnikov OA, Farr N, Partanen A, Bailey MR, Khokhlova VA. Characterization of a multi-element clinical HIFU system using acoustic holography and nonlinear modeling. IEEE Transactions on Ultrasonics, Ferroelectrics, and Frequency Control 60(8), 1683-1698 (2013). 9. Kreider W, Maxwell AD, Yuldashev PV, Cunitz BW, Dunmire B, Sapozhnikov OA, Khokhlova VA. Holography and numerical projection methods for characterizing the three-dimensional acoustic fields of arrays in continuous-wave and transient regimes. J. Acoust. Soc. Am. 134(5), Pt 2, 4153 (2013). Traumatic brain injuries from blast exposure have been called the “signature injury” of military conflicts in Iraq and Afghanistan. This is largely due to our enemies’ unprecedented reliance on explosive weaponry such as improvised explosive devices (IED) (Figure 1). Estimates indicate that approximately 19.5% of deployed military personnel have suffered traumatic brain injuries since 2001 (Rand Report, Invisible Wounds of War, 2008). 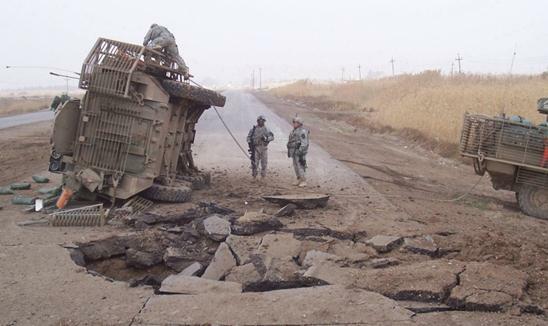 With more than 2 million service members deployed to Iraq and Afghanistan, this means that over 400,000 American Veterans are currently living with the chronic effects of blast exposure. When a blast wave from a high-intensity explosive impacts the head, a wave of intense heat and pressure moves through the skull and brain. Delicate neural tissues are stretched and compressed, potentially leading to cell damage, cell death, hemorrhaging, and inflammation. All regions of the brain are at risk of damage, and the auditory system is no exception. In recent years, increasing numbers of young Veterans with blast exposure have sought help from VA audiologists for hearing-related problems such as poor speech understanding. However, standard tests of hearing sensitivity often show no signs of hearing loss. This this combination of factors often suggests damage to areas in the brain dealing with auditory signals. The efforts of hearing health professionals to help these Veterans are hampered by a lack of information regarding the effects of blast exposure on auditory function. The purpose of this presentation is to present some early results of a study currently underway at the National Center for Rehabilitative Auditory Research (NCRAR) investigating the long term consequences of blast exposure on hearing. Discovering the types of auditory problems caused by blast exposure is a crucial step toward developing effective rehabilitation options for this population. Study participants include Veterans who experienced high-intensity blast waves within the past twelve years. The majority of participants have experienced multiple blast episodes, with the most severe events occurring approximately eight years prior to enrolling in the study. Another group of participants of similar age and gender but with no blast exposure are also included to serve as comparisons to the blast-exposed group (controls). On questionnaires assessing hearing ability in different contexts, blast-exposed Veterans described having more difficulties in many listening situations compared control participants. Common challenging situations reported by blast-exposed Veterans involve understanding speech in background noise, understanding when multiple people are talking simultaneously, and recalling multiple spoken instructions. Further, blast-exposed Veterans are more likely to rate the overall quality of sounds such as music and voices more poorly than control participants, and often report that listening requires greater effort. Different tests of listening abilities found many areas of difficulty which probably help explain self-reports. First, blast-exposed Veterans often have poorer ability to distinguish timing cues than control participants. Hence, sounds may seem blurry or smeared over time. Second, the ability to process sounds presented to both ears is often poorer in blast-exposed Veterans. Normally, listeners are able to utilize small differences in the timing and level of sound arriving at the two ears to improve listening performance, especially in noisy listening environments. This ability is often degraded in blast-exposed Veterans. Third, blast-exposed Veterans are poorer at distinguishing changes in the pitch of sounds compared to control participants, even when the pitch change is large. Lastly, blast-exposed Veterans often have greater difficulty ignoring distracting information in order to focus on listening. This leads to problems such as trouble conversing with others when the television is on or when conversing at restaurants or parties. Our study results show that these listening difficulties are often great enough to impact daily life, causing blast-exposed Veterans to avoid social situations that they once enjoyed. Figure 2 caption: Average EEG responses from blast-exposed and control participant groups in response to a large change in tone pitch. The horizontal axis shows time since the pitch changed (which occurred at time 0 on this axis). The vertical axis shows the magnitude of the neural response of the brain. Notice that the peak of activity in the control group (blue star labeled ‘P300’)is considerably larger and occurs earlier in time compared to the blast-exposed group (red star labeled ‘P300’). Self-assessment and behavioral performance measures are supported by numerous direct measures of auditory processing. Using a type of electroencephalography (EEG), we non-invasively measure the response of the brain to sound by assessing the timing and size of neural activity associated with sound perception and processing. These tests reveal that the brains of blast-exposed Veterans require more time to analyze sound and respond less actively to changes in sounds. For example, the average EEG responses of blast-exposed and control participants are shown in Figure 2. These waveforms reflect neural detection of a large change in the pitch of tones presented to participants. Notice that the peak marked ‘P300’ is larger and occurs earlier in time in control participants compared to blast-exposed Veterans. Similar effects are seen in response to more complex sounds, such as when participants are asked to identify target words among non-target filler words. Overall, these EEG results suggest degraded sound processing in the brains of blast-exposed Veterans compared to control participants. In summary, our results strongly suggest that blast exposure can cause chronic problems in multiple areas of the brain where sound is processed. Blast exposure has the potential to damage auditory areas of the brain as well as cognitive regions, both of which likely contribute to hearing difficulties. Thus, though Veterans may have normal hearing sensitivity, blast exposure may cause problems processing complex sounds. These difficulties may persist for many years after blast exposure.